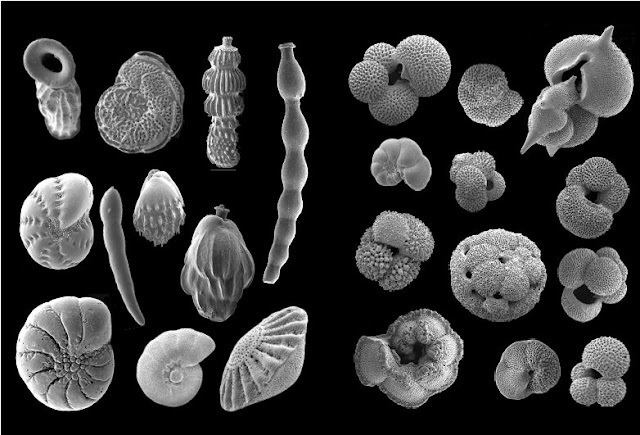 Most of the structures that reveal the type of mechanism at work are microscopic, and we therefore call them micro-structures. 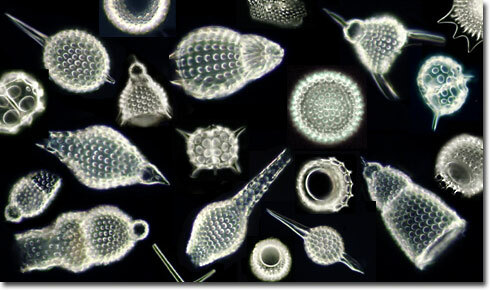 They range in size from the atomic scale to the scale of grain aggregates. Intra-crystalline deformation occurs within individual mineral grains. The smallest deformation structures of this kind actually occur on the atomic scale and can only be studied with the aid of the electron microscope. Larger-scale intra-crystalline micro-structures can be studied under the optical microscope, and encompass features such as grain fracturing, deformation twinning and (plastic) deformation bands. 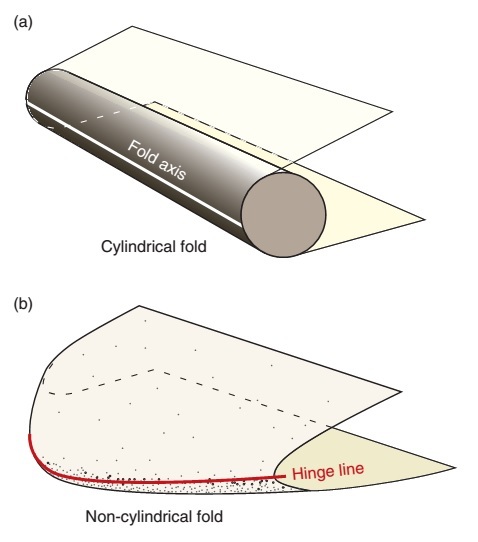 When deformation mechanisms produce micro-structures that affect more than one grain, such as grain boundary sliding or fracturing of mineral aggregates, we have inter-crystalline deformation. Inter-crystalline deformation is particularly common during brittle deformation. The two expressions deformation mechanisms and deformation processes are closely related and are often used interchangeably. However, it is sometimes useful to distinguish between the two. Some deﬁne deformation mechanisms as processes that lead to strain. 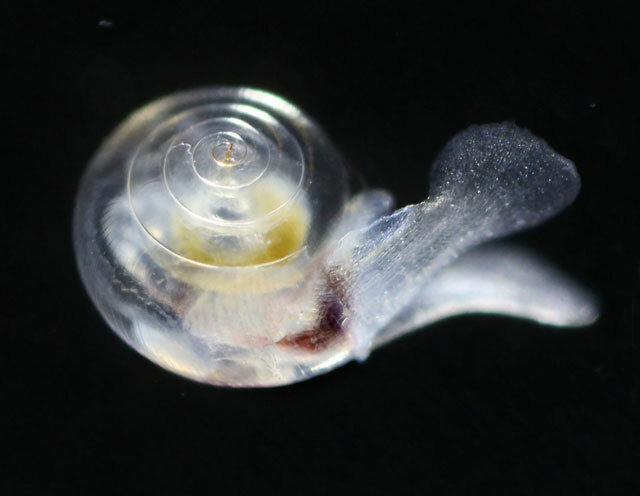 There are other microscopic changes that can occur that do not lead to strain, even though they may still be related to deformation. These are still deformation processes, and include rotation recrystallization, grain boundary migration (explained later in this chapter) and, in some cases, rigid rotation. Furthermore, two or more processes can combine to form a (composite) deformation mechanism. 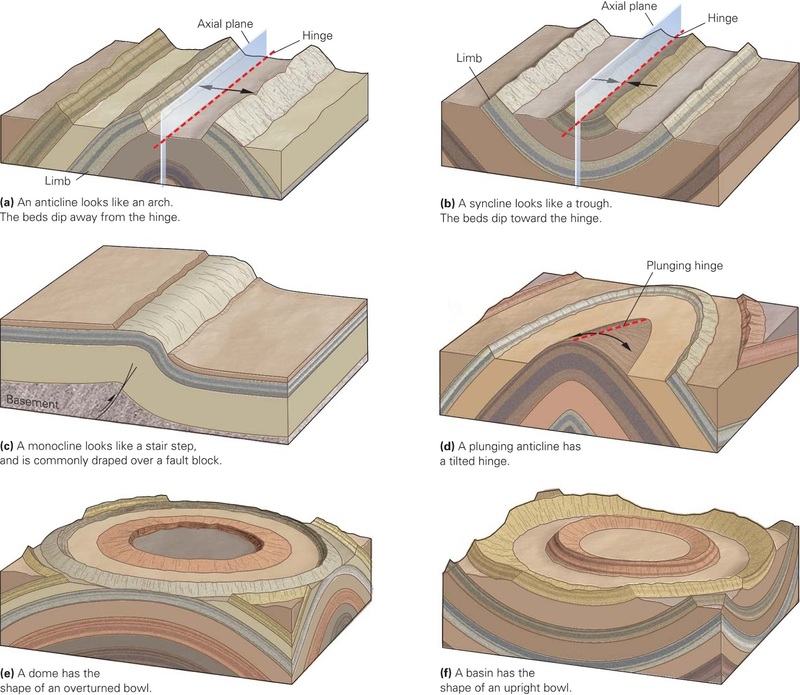 Note that the term deformation process is also used in a more general sense in other ﬁelds of structural geology. Strain is accommodated through the activation of one or more micro-scale deformation mechanisms. Brittle mechanisms dominate the upper crust while plastic mechanisms are increasingly common as pressure and, particularly, temperature increase with depth. However, brittle mechanisms can occur in deep parts of the lithosphere, and plastic mechanisms do occur at or near the surface in some cases. The reason is that not only temperature and pressure control deformation mechanisms, but also the rheology of the deforming mineral(s), availability of ﬂuids and strain rate. While brittle deformation mechanisms can completely dominate deformation of a granitic rock in the upper crust, the transition from completely brittle to perfectly crystal-plastic deformation is gradual. 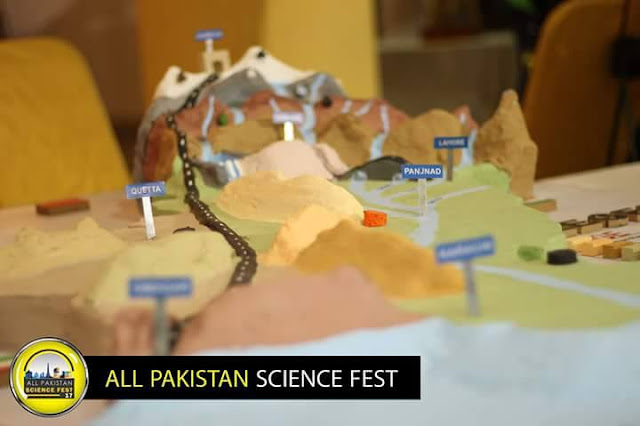 There is a wide range in physical conditions or crustal depths where brittle and plastic mechanisms coexist. For a granitic rock, for example, quartz and feldspar respond differently to stress, particularly for the 300-500 C window. Because most rocks consist of more than one mineral, and different minerals have different brittle-plastic transition windows, the brittle-plastic transition may be a kilometre-thick transition zone even for a single rock type. We therefore ﬁnd that brittle and plastic deformation mechanisms commonly coexist in the same sample even when deformed at a constant depth during a single phase of deformation. The controlling deformation mechanism determines whether the deformation belongs to the brittle or plastic regime. 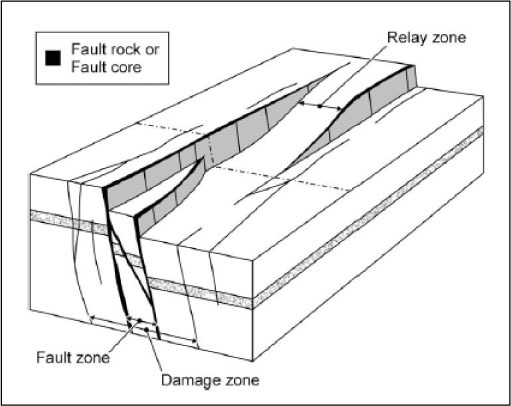 Brittle deformation in an overall plastic setting is mostly restricted to inter-granular fracturing. 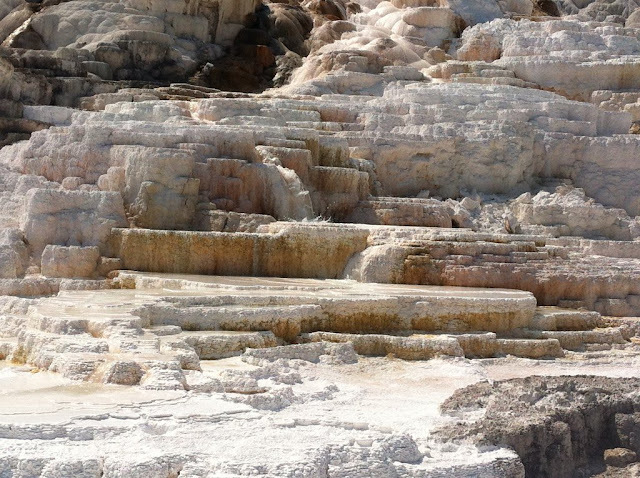 This is again related to the different ways different minerals respond to stress. Fracturing of a stiff mineral, such as garnet or feldspar,in a matrix of quartz is a typical example. The fractures are restricted to the garnet or feldspar grains, while plastic deformation mechanisms make quartz ﬂow plastically. 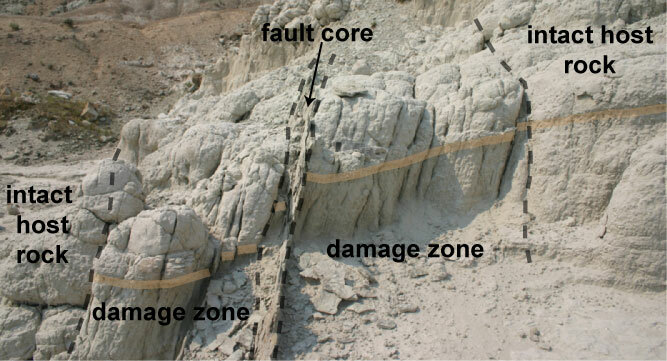 The characteristic feature of brittle deformation is fracturing and frictional sliding. 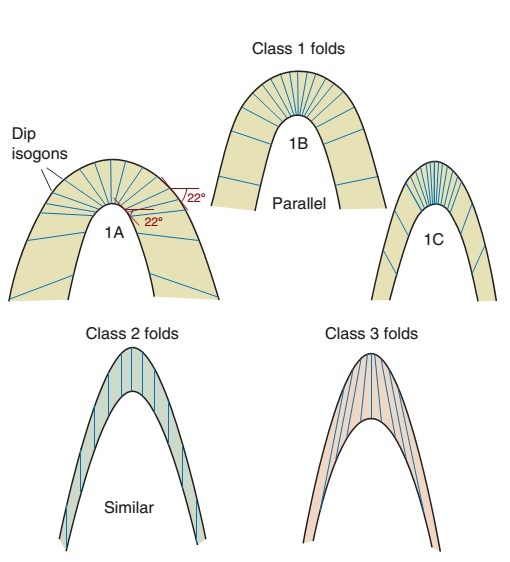 A distinction is drawn between inter-granular fracturing, intra-granular fracturing, frictional sliding on fractures and grain boundaries, and grain rotation. 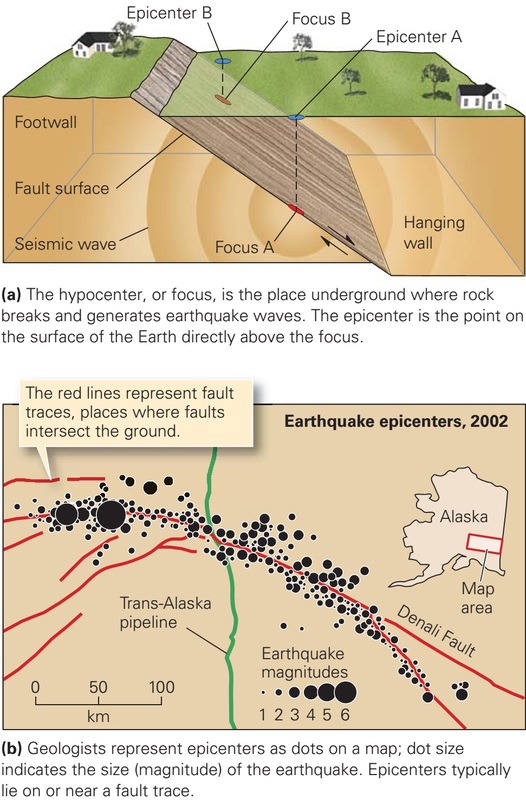 The combination of these deformation mechanisms is called cataclastic ﬂow. 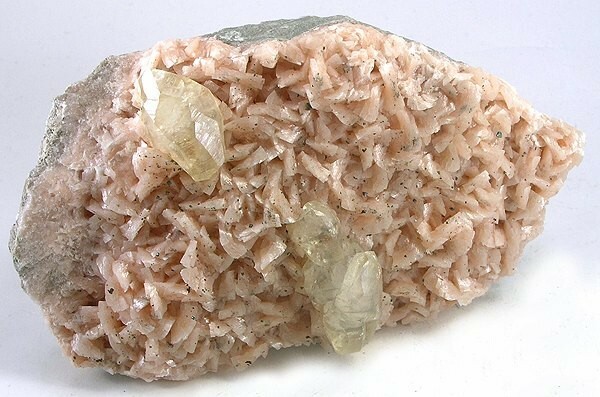 Note that intra-granular and intra-crystalline are equivalent expressions, except that intra-granular is used for granular media such as sand and sandstone, while intra-crystalline is used about crystalline rocks where the porosity is (almost) zero. The deformation mechanisms at very shallow depths are different for porous sediments and (almost) non-porous, crystalline rocks. 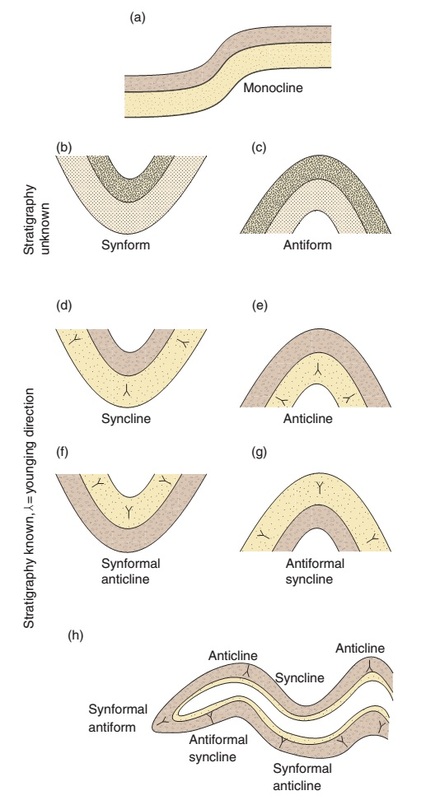 Deformation of an unconsolidated sand or weakly consolidated sandstone buried at less than 1 km depth is governed by two mechanisms: grain rolling (grain rotation) and frictional grain boundary sliding. The process involving these mechanisms is referred to by either of the equivalent terms particulate ﬂow and granular ﬂow. This is inter-granular deformation in the sense that there is no permanent internal deformation of the grains. Granular ﬂow characterizes the deformation of highly porous sediments deforming in a shearing mode or in response to vertical loading (compaction). 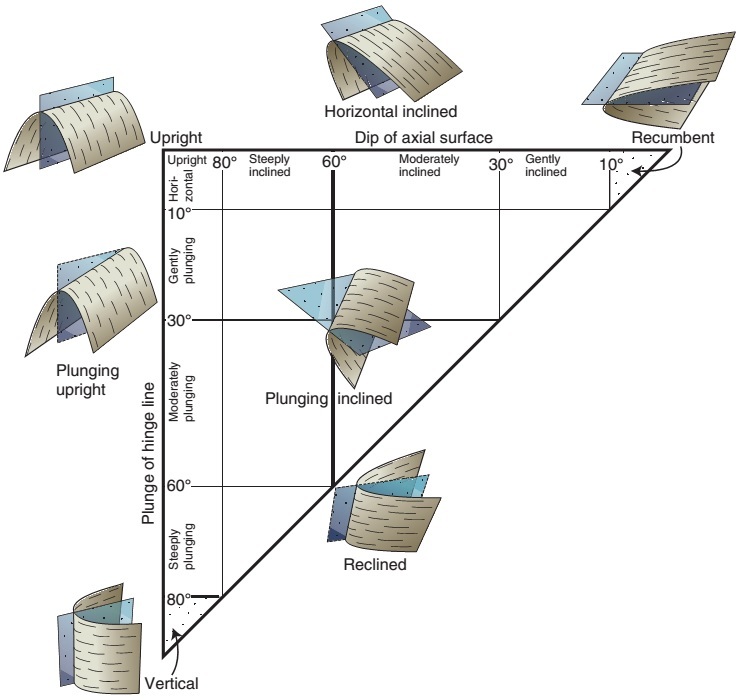 This is explored in a ﬁeld of research known as soil mechanics, relevant to slope stability issues and other soil-oriented engineering problems. 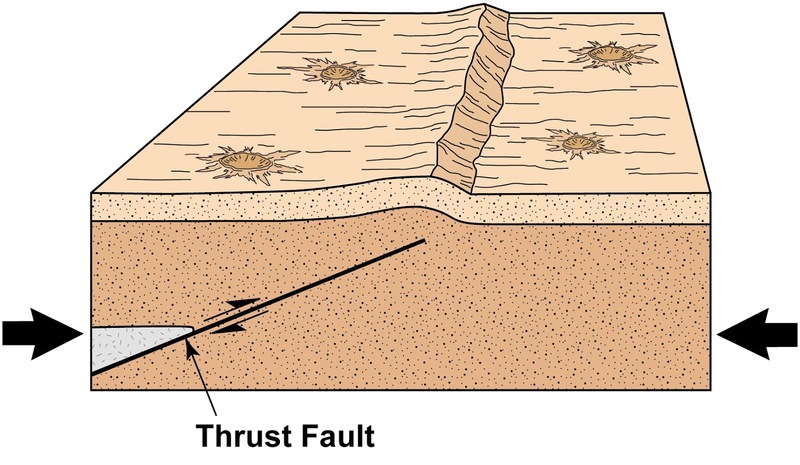 If the stresses across grain contacts become high enough, grains in a highly porous sediment or sedimentary rock will fracture. 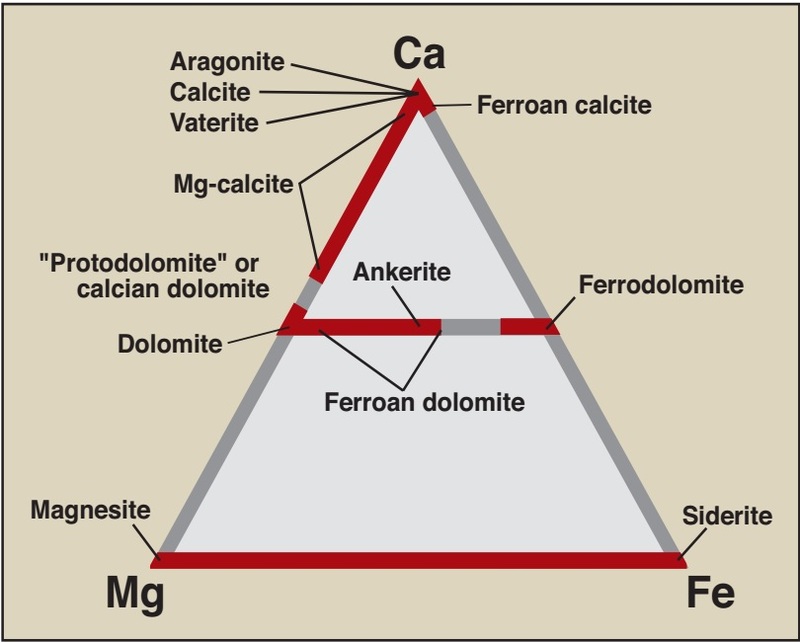 The fractures are conﬁned to individual grains and are therefore intra-granular micro-fractures. Under certain circumstances (low pore pressure and small grain contact areas) micro-fractures may form close to the surface, commonly by chipping off small ﬂakes of the grains. 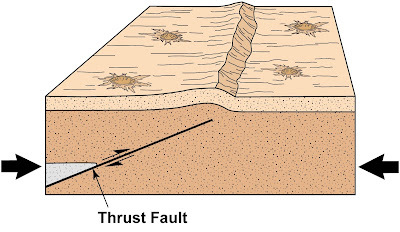 This type of micro-fracturing is referred to as spalling or ﬂaking. 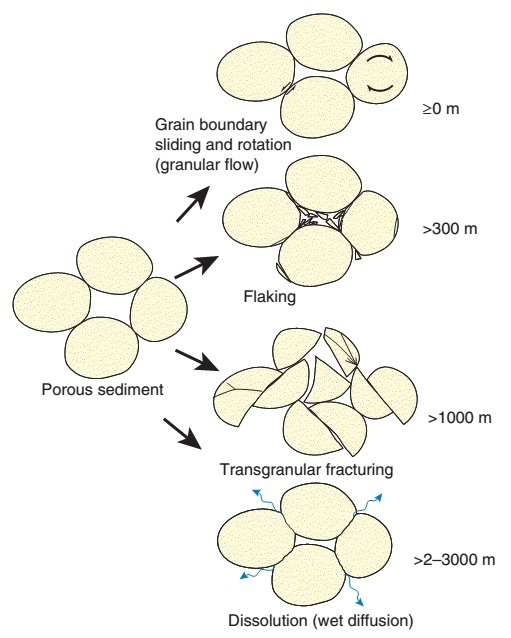 At higher conﬁning pressures, corresponding to depths in excess of 1 km, fractures split the grains into more evenly sized parts, and this mechanism is sometimes described as trans-granular fracturing. Some use the term trans-granular as a substitute for inter-granular, i.e. about fractures that cut across several grains, so some care should be exercised when using these terms. Once fractured, the grains reorganize themselves by frictional sliding and rotation, leading to porosity reduction. Grains in non-porous or low-porosity rocks develop fractures that may already be inter-granular at the initial stages of deformation. As more and more fractures form, frictional sliding along these fractures together with rotation of grains may be widespread enough that we can characterize the deformation by the term cataclastic ﬂow. From this point on the rock becomes crushed into a gouge, breccia or cataclasite. 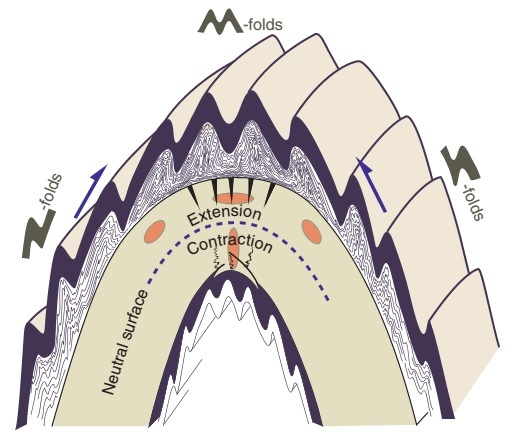 In general, cataclasis in low-porosity rocks involves dilation and increased permeability as fractures form and open. 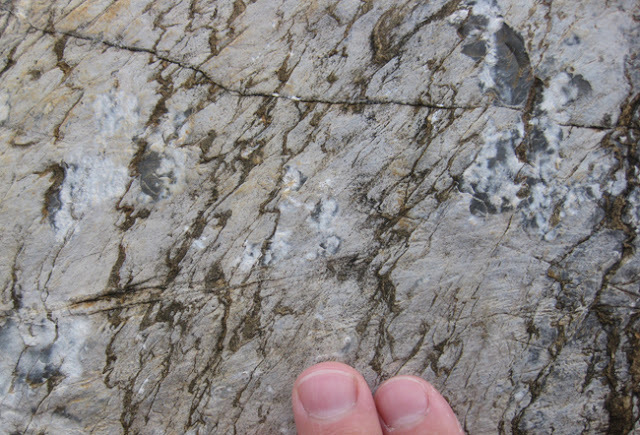 Incohesive gouge and breccia dominate the uppermost few kilometres of the crust, while cohesive breccia and cataclasite are more common from roughly 3-5 to 10-12 km depth. In the rest of this chapter we will look at crystal-plastic deformation mechanisms.